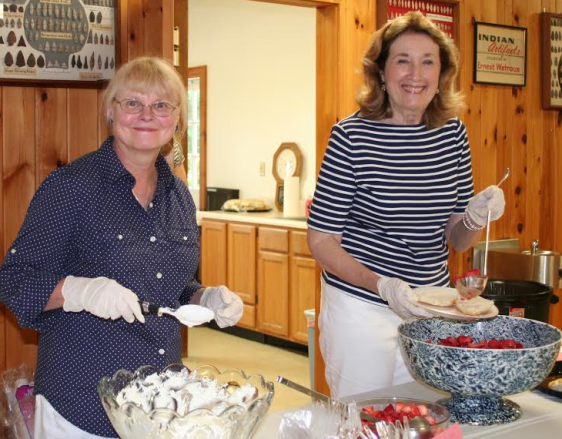 Marian Staye (left) and Gail Gallagher serve up fresh strawberries and homemade whipped cream in Deep River. File photo. DEEP RIVER – The Deep River Historical Society is holding its annual fundraising Strawberry Social on Sunday, June 11, from 2 to 4 p.m. Yes, you can expect fresh strawberries and homemade whipped cream … and soft drinks are included too! There will also be a selection of Berry Basket Surprise items available. Tickets are $6 for adults and $3 for children 5 years and under. The event will include other surprises for the guests. The event is held in the Carriage House on the grounds of the Deep River Historical Society at 245 Main Street (Rte. 154), Deep River. For more information, contact Sue Wisner at 860.526.9103.